My First Official Experience as a Guest Blogger!!! Let me start by giving a specail THANKS! to Cookie's Chronicles for this opportunity! I love this idea! Thanks to both Cookies Chronicles and Mama Kat for sharing! Cookie's Chronicles: Cleaning House Collage: "Today I'm linking up with Mama Kat for her Pretty Much World Famous Writer's Workshop. The prompt that inspired this post: Share a favorite..."
My life as a Tangled song! 2 diaper changes, day clothes, and daddy get kissed! As we slow down with a story or two. All ready for slumber and finally nap time begins. Now, onto my blogging, house cleaning, phone calling, trying to get it all in! This is your life with kids. I could never give it all up! Because now that their older the kids are much bolder and I won’t be as busy as I am. So, I’ll smile and giggle at every little wiggle waiting for naptime to end. That is my Tangled life. Sort of, I was trying to rhyme like they did, had to cut a lot of stuff or it would be a long song, and didn’t know how to end it. So, I ask each of you what your Tangled life is like? We all think at times, I wish my life were a song or movie, but what would our live’ be like if they were one? Try it out write your own script and remember only you can change your storyline! Need a gift for someone, but want it to be something that looks good, is one of a kind, and will involve the kids? Have them help, there are so many things that you can make with the kids or have them help with to make good looking gifts that are one of a kind. For this craft we will be decorating a frame with a kids touch. Any wooden decorator piece or add on to jazz it up! First, start with the kid’s portion of this craft. Have them create a few different paintings either by finger painting or by painting with brushes onto a few different pieces of paper. Watch to make sure they don’t try to eat, rip, or attach the paper to themselves or the things around them while they are painting. Once, they have created what they want have them choose the add on to be attached once the frame is covered. Depending on the age of the child the next few steps may need to be done by you. The first thing to do once the painting is dried is to cut it in strips. If the kids are able to use safety scissors this may be something they can do for you. If not naptime or after bed time may be good times to finish this project. Once the painting is cut into strips, using one of the strips figure out how long the strips should be by using one and placing it around the frame leaving the back of the frame slightly open for any attachments for the wall. Note make sure the paper will cover the front and sides of the frame with at least a centimeter going onto the back of the frame for attachment. Now, use this strip as a guide to cut all the other strips down. Once, your strips are cut to size pick a place on your frame and start decoupaging the strips to the frame making sure to put some decoupage on the frame than coating the strip to hold it down. Make sure each strip slightly overlaps the one before it leaving the corners exposed for places to hold to reduce fingerprints being left in the decoupage. Once coated allow to dry. Once dry you can either cover the corners with the add on chosen, decoupage the strips to cover the corners, or hot glue on fabric scraps. Again, allow whichever you’ve chosen to dry. Repeat decoupaging if you wish for strength. Once dry, you can attach add on on top of the decoupage with a hot glue gun. Then, using a nail smaller than the eye hole hooks, hammer in the nail slightly and remove it to start the wholes for the eye hooks. Make sure to place them the same distance from the edge of the frame or the frame may hang crooked. Twist in the eye hooks until tight. Now, thread the ribbon threw and ties a bow. Use the scissors to cut down the left over ends of the ribbon and hot glue the ribbon and ends together to keep the ends from fraying and ribbon from coming untied. If you wish you may double knot the bow before gluing the ends down. Allow the glue to dry, add your picture and you have a personalized one of kind amazing kid creation that looks just as good as many of the frames found in today’s store. The kids love to know that they got to put their own stamp on the gift and you have found a creative way to display their art work! Ask the kids why they are drawing or painting what they are for the person the frame is for and write it in your Kids’ Journal. Enjoy seeing the kids take the project serious because for many kids presents are serious business. Lastly, make as many as you want and decorate your own home is a special way that only your family could create. To end, some of the best artwork and crafts I’ve seen have been made by a child whose mind is still untainted by the events of the world around them and unrestricted by wither or not something is possible, while restrictions in the world exit the biggest ones we will face are the ones we give ourselves with the word won’t. Open your mind and discover the Monet in us all! Table looking dirty, but the kids are in need of something to stimulate their creative juices? Why not combine the two! I have found that shaving cream is very good at cleaning surfaces like tables and leaves them smelling great!! 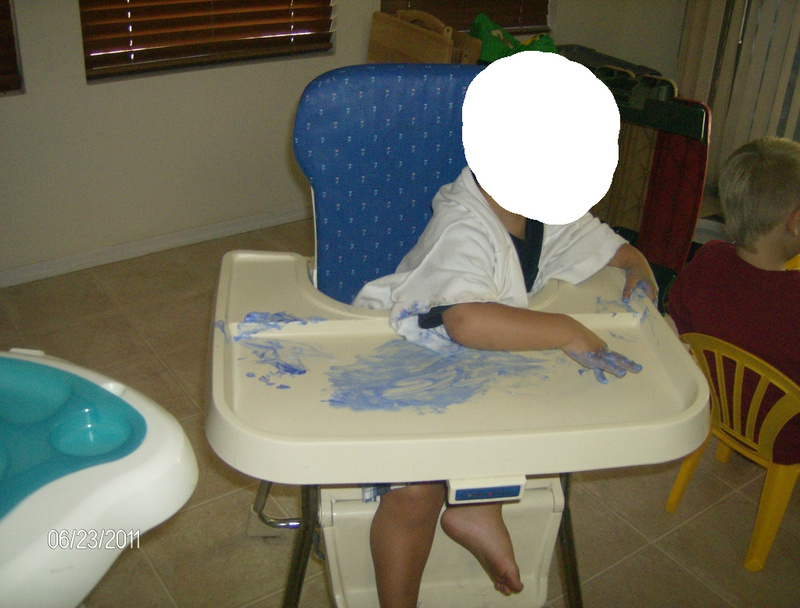 So, with some close supervision and paint shirts I decided to have the kids enjoy some creative play while they helped clean up the table and high chairs. First, make sure the floor around them is clear and in a state where any droppings won’t matter. Put the paint shirt on the kid. Squirt a line of shaving cream in front of them, let it grow if its gel, add squirts of paint and let the kids get to smearing! Watch for hands near mouths or eyes so make sure to have hair pulled back if needed. Once the kid is done, have them put out one finger and draw a design in the shaving cream. Tell them “Hands up and fingers wide” Now, press the piece of paper down on their design and VIOLA! The shaving cream creation is done! Make sure to write about the experience with textures, scents, and a new art medium in your kids journal! You can have them erase their drawing and create a new one, or if needed add more shaving cream and paint and let them do it again! Once they are done, this is my favorite part, hand the kid a dry or slightly damp paper towel depending on the state of the shaving cream and have them wipe it up! Now, wipe up the kid, throw the paint shirt in the wash and you have cleaned the table, done a craft, and perfumed your kid in one fun activity! Talk about some multitasking goodness! In closing, sometimes situations that look messy are really just the quickest way of getting multiple things done, so don’t shy away from the fray jump right in and find a new way to appreciate a little mess again! Life is messy, use the messy to clean itself up! Way too hot! Bring on the Rain!!! It has been blistering outside with the heat wave and living in the concrete heating pad called Phoenix. We almost got a storm, even if it was part Haboob (dust storm), but because of how hot it is the thing dissipated before it got to us. Very disappointing as a little rain might cool this place to under 100 for a day, which would be awesome! So, what do you do when the kids ask for rain? You make a rain stick! Something that provides at least the sound so the kids can pretend there is a huge storm outside. The baby’s love the sound and the kids enjoy feeling like they have control over the weather even if it’s just in their imaginations. Amazing how a kid’s imagination can cool them off almost as much as the real thing! Start with the foil. Measure the length to be 1 ½ the length of the tube you are using. Roll it tightly into a long line. Make sure to squeeze it tightly so it’s nicely packed. Once you are done, twist it around the end of the broom handle so it forms a spiral. Try to keep it as tight as possible for a heavier rain sound. Tape one end of the foil to the inside of the tube lid using duct tape. I suggest taping around the end and then taping the tape to the lid for added security. Be careful not to tape the sides of the lid or you can create a hole or make it so the lid and tube won’t seal. Next, thread the coiled foil inside the tube attaching the tube lid once threaded through. Tape with duct tape, I start by taping the lid down onto the tube and then going around the end of the tube with a round of two of tape, thus taping down the ends of the applied tape and adding to the security of your tube. From here things can get a little messy. Add your Rice and Peas (I like this mixture because they seem to add more rain sounds since their different shapes bounce off each other and last a little longer due to the shape contrast). You want to fill your tube between 1/4 and 1/3 of the way full. Any fuller and you may not get a rain sound or it will be very short. Be careful of falling rice and peas as they will need to be swept up or vacuumed depending on your floor. Now, this part is tricky mainly because of the area to work with, you will be attaching the other end of the foil to the lid of the tube. The same method as before should be used but don’t pull too hard or you can uncoil your foil. For this reason you may need to use feel to tape it on or have someone bend down and look up at what you are doing directing you. Once, the foil is attached securely close the lid and tape it down as you did with the other end. The fun part is here. Have the kids paint the construction paper with their own idea of rain. They can use any color, we chose blue because water is blue, and have them paint away. Allow the painting to dry than wrap it around your tube attaching with clear packing tape. If you or the kids want add bits of felt, jewels for raindrops, or other rain/water like foam cut outs to the outside of the tube on the construction paper. Wrap your entire tube in contact paper or with clear packing tape to protect the design and add to the security of your tube for less breaking and spills. Sandra Chisholm Robinson, or sing songs about rain with the kids! Enjoy your rainy indoor day and escape the heat! Make sure to write down anything insightful the kids say or do with the rain sticks. In closing, the weather may not be pleasant and the indoors claustrophobic, but the doors to the entire world are just a few old items with a dab of imagination away and you are only limited by what you can imagine. It’s the day of travel and the car is loaded up! Remember that when traveling fashion should be the last thing on your mind, however please don’t forget the deodorant for your neighbors sake. A splash of mascara and lip-gloss is alright, but if you’re traveling with kids chances are one will end up in your lap and anything will just get smeared so might as well take a few extra Z’s and skip it. Do apply lip-gloss if you’re like me and airplane air dries you out. Wear clothing that doesn’t have metal, straps on shoes, ties on shoes if you can(depends on where you’re going and weather), avoid anything low cut or you may end up providing a show you didn’t plan on, and skirts may not be the best idea for the previously stated reason. I wore jeans (no belt), crocs, a tee shirt, with my hair in a pony tail, and no jewelry other than my wedding ring because if it sets off the sensor than that’s additional time I have to spend at the security check point. My husband wore shorts no belt needed, crocs, and a tee shirt. Our son wore a shirt, socks, and shorts. My daughter wore her flip flops with socks (easy off and on with no metal) and a dress because her dad dressed her, but she looked cute and it travelled well. First, we dropped off the dogs at the dog sitter and unloaded their items. We said good bye and to be honest I felt like I was leaving 3 of my kids behind. That said in no way would I be loading 3 dogs on a plane without moving somewhere that driving isn’t an option. That is one task I’m not ready to explore or conquer without knowing it was a onetime deal or there would at least be months before attempting it again. I do admit to tearing up at leaving them. It is amazing how a furry animal can become such a close family member and friend that our hearts are pulled when we must be away. Next, find parking. We brought towels to cover the babies car seat and tried to park as close to the airport bus stop as possible in economy parking. It is Arizona and heat is still heat so if you live somewhere hot expect hot when you get back. We loaded up and trucked over to the stop just in time for a bus to pull up a few seconds later. My husband loaded the big suitcase, a travel bag, and my daughter onto the bus. Remember that my daughter is now in her car seat with the GOGO BABY attached and Fold and play tray. My son is in the front loader carrier and strapped to my front with a bag on each of my arms. We have a fairly smooth ride to the main building and unload last to save our fellow riders the wait of our unloading process. Next stop is checking in inside because we have a lap baby. We are both loaded down and the kids are nicely quiet taking it all in. Once we get to the counter, birth certificates and shot records are given along with our ID’s. The bag is checked and we get the lap baby boarding pass, ID’s, and records back. Ah, one bag lighter we go into the security line. The kids love all the attention and craziness going on around them. My daughter is playing hide and seek with everyone who looks at her using her fold and go tray to hide behind, my son is just staring and randomly exploding with wiggles in the front loader and my husband and me are ready to be sitting and not in line for a few minutes. We get to security and the unloading begins. Unload the toddler from the seat which has to be hand checked, take out all fluids and they go to the testing table to meet us, shoes off, baby out of front loader so front loader can go in a tray, everything in trays and finally we walk through the detector. The reloading starts again, putting shoes back on, baby back in front loader, making sure everything is back in the bags(laptops etc), and my husband goes to retrieve the car seat to reload the toddler who is loving the moment of freedom. Once reloaded, we go to the testing table to witness the testing. All the food, bottles, medicines, tubes of cream, and even the wipes were tested. Once cleared, everything is put back and we are ready to find our terminal! A quick check of the screens and the terminal is found! Yeah, now to put all the bags down and change diapers before we load! The hubby smartly grabs us some breakfast which we share with the toddler and no sooner do we stuff the food down, but our plane is boarding! Up again, bags in place boarding passes and records in hand we give the ticket taker the documents. Records are given back and we are allowed to enter the tunnel to the plane. At this time bags are transferred to me except one since my husband will have to lift up and carry the car seat holding my daughter which up to this point has been wheeled. We choose a seat in the back and as I walk by apologizing for any bags or discomfort I may be causing those on the isle I also warn of my husband coming behind me with the car seat so people can watch their heads since he can’t see them over the seat. We pick a seat in the back, close to a bathroom and to allow us to exit last disturbing as few people as possible. I move aside so my husband can set the car seat and daughter in her seat by the window as required. I put the bags in one seat, unstrapped my son who goes to dad and squeeze in to unstrapped the GOGOBABY and than attach the car seat to the airplane seat using the method shown in my car seat owner’s manual which I smartly put in the green folder. Daughter situated, I go to organizing bags, food bag under seat in front of her, diaper bag under seat in front of husband and toy bag in front of me. Son is handed to me and my husband puts his carry one and the GOGOBABY in the overhead before finally settling into his seat. Sippy’s and bottles are brought out and we get ready for a cramped and long flight to Maryland! During the flight I did my best to keep my daughter who isn’t used to napping sitting up quiet and entertained with what we brought, made sure she didn’t kick the seat in front of her, and did what I could to respect those around us. Some passengers were kind and would later say our kids did amazingly well at travelling. Others gave looks of annoyance before they even sat down telling me they were either just rude people or had bad experiences. I will admit to a slight temptation to allow a kick to occur, but the desire to have a child who is well behaved overruled my desire to remind people to not judge a book by the cover. There were other children on the flight, mostly older than mine with one other infant and compared to most of them my kids did amazing. There were some older kids who were very well behaved, but their parents also seemed to have preplanned and made sure to work with the kids before the flight as I heard may of comments regarding previous plane talks and noticed plane oriented toys and books. I’m hoping that early discipline, training, and preplanning will allow for my kids to continue being in the group of little breakdowns and misbehavior. The flight back was very similar. Naturally, we were so glad to be back home mainly because that’s where our puppies were. We also like having our own beds to sleep in as do most people, but did not enjoy finding that our gas tank was mysteriously empty (was one quarter full when we parked it I know because I literally checked the night before to make sure we had enough gas for the trip to drop off the dogs, airport, back to dogs, and home! Can you say siphoned!) or that a dust storm resembling something off the Mummy pulled into town about an hour after we got home. While the plane rides were hectic and stressful I was glad we had the foresight to pack, talk, create, and strategize like we had. It made for an easier transition and smoother travel. Of course travelling to be with family does make you think about how much easier raising a family is when there are extended family around to share moments with and to help out. To close, like anything that takes time, energy, planning, and a few bumps in the road there is always a reward at the end. For example: Getting to meet family for the first time, see amazing parts of this country’s history come to life in a reenactment, visiting our great capital and being amazed at how big and little it is at the same time, finding out who your spouse is by seeing where they grew up, and of course the Maryland blue crabs from E J's Restaurant in Union Bridge, Maryland! 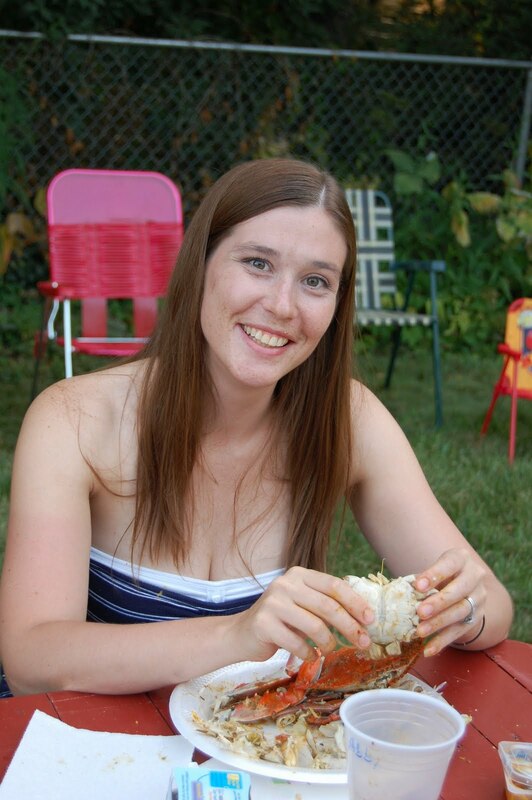 Seriously, their Old Bay is amazing and the crabs are so taste if you get the chance, get some! I wish I had some now! At the end of every journey we find ourselves expanded and our taste buds hungry  for more!!!! 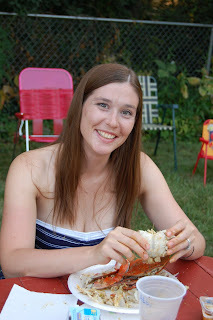 The picture is of me enjoying some crab at the crabfeed! The video is of my husband and I talking about the dust storm and what we saw out our window and on the news. Ignore my exhausted look, we just got home and are unpacking from our trip, you can see just how crazy the storm is by the look on my face and the tone/words my husband uses to describe the storm. The storm left clean up of about a week for our pool vacuum and my husband since it kept clogging the pool vac and sticking to the sides of the pool! It is about ten minutes long. I definately recommend getting this product to help you travel with kids in the upright car seats! So, now that you have packed your bags, created you own bottle savers, made a toy for plane time fun, and have purchased your travel savers it’s a good idea to talk to your kids about what they are in store for. Even really young kids like my 1 ½ year old should at least get to be exposed to the idea of flight, so it will be less scary. Talk to them on a basis of their age level as far as depth and how flying works. Let them know that there may be turbulence and explain what it means for the older kids. This way when they hear the pilot talk about it over the speaker they can better understand what is happening and feel more grown up! Next, maybe do some experiments with flight to get the kids involved. Reading books, doing experiments, making crafts are great ways to make flying less scary and more of a learning experience. Start by looking around your house for things that float: balloons, feathers, scarves, and tissue paper are good things to find. Have the kids help find things they think can float and experiment with them. Some things they pick out may not float and that’s good for learning. This way they will make connections in their own minds on how floating works. Note: If you have a straw you can have a feather race and see who can blow the feather using the straw across the floor fastest! See if any of the kids and yourself is able to juggle the floating scarves. Blow up the balloons to different sizes and see which one stays up longer and which goes to the ground quicker. These are things all ages can enjoy. The little ones may not be able to be in the feather race, but they do get a kick out of seeing the feather react when blown on and usually giggle at the feathers floaty dance. I asked the little ones if they could do a floaty dance of their own, they each tried twirling or waving arms and had a blast. By showing the kids how many things can float or fly a little it makes the idea of being in a plane flying easier to grasp and understand. It also sets up for plane conversation in regards to what they think the plane fly’s like, is it balloon like, feather like, scarf like, or tissue paper like. For older kids able to follow a lot of instructions have them decorate a piece of paper. Then, either with your verbal instructions or with physical help create paper planes. I suggest adding stickers or a paper clip to the front for more streamline flying. Then, have them be the pilot and fly around the room. Ask, what they notice, does how hard they throw it matter to distance, or does it fly in a straight line or bounce occasionally? These are all great questions to ask. As always when doing any of these things write them down in your kids say the darnedest things journal. Being trapped on a plane for hours is no fun even if you’re alone. Sometimes it can be scary when the turbulence gets bad for us, so to a child who is used to being able to move around a lot with feet firmly on the ground being on a plane can be torture. By explaining, having fun with flight, and opening a dialog with them it makes it less scary and more of an adventure. It also, gets their minds thinking about how things work, engineering, and motion. In closing, we never know what experience in life our children will remember, which ones will shape them, which one’s will inspire, and which ones will click within them as something to pursue as a career or goal. The more we explain, expose, and explore with them the more we offer them to pick from in life. I knew we were going to bring books for the plane and made sure to pick some favorites for the kids, but what about toys? They take up so much room and losing a favorite toy can be a problem with a 1 ½ year old. So, what can you bring for a one year old to play with that you won’t care if it gets ruined or lost? Why not take a trip back to your own childhood and make some sock puppets?!!! They don’t have to be elaborate just silly! Bottle/Sippy Attachment required for Travel!!! One of the things that you will hate to lose while on your trip is any Sippy’s, bottles, or pacifiers. You can only bring so many and there aren’t always stores around to get more at that your child will use. If you kids are anything like mine, they get attached to a specific type of beverage container and those aren’t found everywhere. For this reason you can either go out and buy a bunch of those bottle attachments, or you can go to the craft store, get some ribbon, Velcro, a needle and thread and make your own for half the cost therefore half the disappointment if they get ruined on the trip or in the wash.
Start by looking at your thread and deciding how you want it to go around the Sippy or bottle by wrapping on end around the bottle. Make sure to use the largest Sippy or bottle you have, I suggest comparing it to the smallest you have as you may want to add a second section of Velcro for the different sizes or just use a longer Velcro strip. Mark the spot that the end of the ribbon will overlap by an inch with a pin or by holding onto it with your hand and if you have your needle and thread ready start stitching it on. If you marked the spot with a pin than get you needle loaded place the Velcro against that spot and stick it on. Note: If you want the design side of the ribbon to show around the bottle than attach the Velcro you marked on the side that has no design. Once you’ve stitched on the Velcro making sure to only stitch around the edges and try to make sure not to sew down any of the Velcro or it will function less properly. Now attach the other side of the Velcro to the end closes to your already attached Velcro. Again, be careful not to sew down any of the Velcro and stick to the edges. This side is your bottle or pacifier attachment as the pacifier can be threaded through. For the other end of the ribbon you have a few options. You can either repeat the process above and Velcro it to whatever you may need to, but make sure to measure that as you did the bottles for the Velcro placement. Note: you may need a longer ribbon if what you attach it to is thick. You can attach a suspender clip that you purchased at the craft store and clip it to the child, around something and then to the ribbon itself, or to a fabric part of the car seat if available. The last option is the one I used which was to attach elastic to the end. This way I could wrap the ribbon itself around the object, thread the Velcro end through my elastic loop and pull tight before attaching the Sippy. I like this option for the ease of sewing it offers, option of ribbon used giving me more options for what to attach it to, and the security in knowing that it wouldn’t come loose. I took a half inch wide elastic band and measured out 3 inches. I sewed one end of the elastic to my available end of ribbon. I then created a loop with the elastic and sewed the other end next to the one already attached. I made sure it worked by quickly attaching it to the chair and a cup. Viola!!!! Cheap and easy ready to go! I made one in red and one in blue to keep track of whose bottle was whose. You can make as many as you wish, add on gems or charms for added flare, and even add kids names with Applica’s if you wish. It took me a while to figure out just how I wanted to make this and so I’m passing it on to you, so you can look at the options and make it quicker. Also, I wanted to add that it is a good idea to put a min-purell in your baby bag since you can use it to disinfect everything. Planes are infested with other people and their germs. Keeping the Sippy or bottle attached to your kid and off the floor along with purelling yourself, the kids, and everything around them will help you avoid some nasty bugs. In closing:as often is seen in life we can either spend a fortune to make things easier on ourselves, or save the money by making things to make things easier ourselves and use the money for a trip later! Packing A Bag For 4?!!! Since, I already called the airline I can start packing. I went ahead and found my travel storage bags that you can roll up to get the air out making for more room in the suitcase. I haven’t used these since we moved, so I’m hoping they hold up on the trip. I started with the kids, since they have the largest need. I figured that with being gone for 5 days I should pack 7 outfits (two usually get messy, one will go in the diaper bag and the other is an extra that will also be for colder weather in case we get a chilly day), plus 4 sleeper outfits ( my son sweats a lot), two shoes for my daughter (one sandal and one tennis shoe for when we are at the farm), socks for both, one blanket each (the smell will help with comfort in a strange place), light jackets each, 6 bibs- 3 each as they can be rinsed off each night and set out to dry if needed, a swimsuit each since play in a pool was planned, 4 little swimmers diapers (2 per kid since only one day of swim play was planned) 2-wash clothes, 3 burp rags, and one sun hat each(even though they won’t keep them on). We already had blankets, towels, rags, bibs, play yard sheets, and changing table pads waiting at our destination which cut down on the packing some. I put the two wash clothes wet in baggies and in the diaper bag for cleanup on the plane if needed, wipes are great but sometimes they don’t get stuff off as easy as the rag does). The two hats, the bibs, burp rags, one extra outfit each, all went into the diaper bags. The rest was divided into the airlock bags and the air squeezed out. The shoes were placed in the suitcase sans bag. I went over the outfits over and over and widdled down to the amount I’m listing here for packing. In the end only one outfit went unworn and the hats not used (I would still bring them again just in case). Now, for my husband and me to pack our clothes for this trip. I had him put out what he wanted to bring and loaded that first. I then put out 5 outfits for myself, plus one dress I was saving for the DC trip! I made sure to pack extra underwear 2 pairs each, socks, one pair of shoes, plus a very thin pair of flip flops, I packed a sensible(not one of my fashionable) purse for the outings where the kids were left with the grandparents, one sleep clothes set (thinnest I had for space) and a belt. I put it all in bags except the shoes, purse, and belt and squeezed the air out. I loaded the father’s day gift for grandpop and the birthday gift for grandmom in the middle of the bags. Next, I had to tackle our toiletries!!! We decided to use the soap, towels, rags, shampoo and conditioner, lotion, and sun block of my husband’s parents. This left for us to pack, shaving equipment, toothbrushes, my prescription tooth paste, other meds, my night cream, deodorant, vitamins, facial cleanser, hair brush, and hair bands. I packed them into the toiletry bag which was added to the suitcase! Or so I thought because upon arrival I found that I had left my toothbrush at home on the counter to be packed so even with all my rechecks I managed to miss something. The suitcase was clothes and rechecked 3 times before being loaded into the car. The diaper bags were stocked with the bottle cooler filled with bottles and sippy's for the plane (be careful what you pack they test all gels and fluids), a container of my daughters lunch I premade, and a container of homemade baby food for lunch and one for breakfast for my son. I added two small Tupperware containers with enough formula and enfagrow formula for two bottles/sippy’s in case of a plane delay. I then packed two separate sandwich bags for each kid with their potential needed meds, nasal suction, oragel, mycilon, miralax, Tylenol, Motrin, teaspoon syringe, and little noses saline. I labeled each so that it would be easy to tell whose is whose by grandparents and on the plane. I made sure the baby silverware was all plastic, put in a small container of fishes along with one of cinnamon chex and a few mum-mum’s in side pockets for baby snack attacks, made sure the mini-first aid kits were in the side pockets, took out the thermometers, added Neosporin and Desitin to the side pockets for easy access, and made sure there was a good stock of diapers and wipes for the ride. To help myself out I put a small stash of wipes in a baggy along with two diapers in a side pocket which I transferred to the pocket in the back of the seat in front of me on the plane. This was helpful since once you get going the last thing you want when a potential blow out is occurring is to have to riffle through a small space for what you need. Remember to try to keep all fluids and gels in one bag so you only have to unload one for testing if you have two kids. If you only have one than keep fluids and gels near the top or on side pockets for time and less headaches when unloading for testing. For my carry on I put in all the books, portable DVD player and DVD’s, bye-bye baby, front load carrier for my son, and homemade toys. My husband’s carryon held our wallets, his laptop, books, and other work/school related materials. I put together a folder of a copy of each kids birth certificates, copies of their shots records, map of DC, tourist brochure of DC, DR’s information, list of approved Urgent Care Centers and Hospitals for our insurance (I called ahead for this since often you need to notify your insurance of trips for potential out of area coverage which they will note on your account (get a reference number for the call always! )), and our boarding passes sans the lap baby pass which you get upon checking in at the counter. I brought two copies of the boarding passes/tickets; one for use and the other to prove we purchased the extra seat for the car seat when asked and if needed. I put this folder in the side pocket of a carry on to make everything easy to access and put in some paper clips to put ID’s with passes so it made going through security quicker and less fumbling. I made sure to check everything at least 3 times before we left and was taking stuff out up until we got into the car to leave. What I listed above is what they end result was and I’m glad we took everything we did since we seemed prepared for everything we encountered and while I’m sure there are places to improve things seemed to go smoother than they would have had I not prepared as I did. This brings the total bags to one large suitcase, 2 diaper bags, 2 carry on, and one car seat on wheels with play and fold tray. I will continue to add to the blogs about the travel prep and what seemed to work on this adventure of ours! I hope to those reading that it helps in your travels and you are able to share your improvement and tricks to the rest of us! In closing, always call, think, and pack ahead for everything and you’ll never wish you had done more before leaving to go anywhere. This is not only true when traveling with kids, but in life in general, since a little effort in the front end makes for more fun with less worry on the back end! The pictures are in the Baltimore Airport. Airplane Travel, Are we nuts?!!!!! OMG! Are my husband and I seriously going to do this? Take two babies on a plane for about 5 hours? Travel across a 3 hour time change for 5 days? We have definitely lost our minds and the desire to meet extended family along with get away from the 112 degree weather for 80 is over powering! The draw of seeing DC and the Gettysburg reenactment didn’t help my judgment either. So, where do we start? The tickets are purchased and now the daunting task of making sure everything is in order begins. To start, make sure the extra ticket bought for my daughter so we can bring her car seat is an infant seat so she can board with us in family boarding. Check in with the airline on what they allow me to bring. What to bring both in the suitcase and in carry-on is a task. Calling the airline gives a better idea on what is even possible. Now, one can pack it all pay a ton of money for extra luggage while risking having all your baby stuff ruined during the flight, you can go to one of the many travel baby websites and have stuff rented and waiting at your hotel (call your hotel first to make sure they have space to hold in case delivered early), or if you’re traveling to family have them buy consignment or borrow from other family in their area and have the stuff waiting there. We decided that since we have two big car seats it was alright to risk the one having it travel with us in the extra seat, but the seat for my smaller son was definitely provided by family on the other end. Play yards, monitors, high chairs or booster seats, a baby tub, a swing and a bouncer all were supplied by family along with a few extra bottles, Sippy’s, spoons, formula, and I had microwavable steamers and baby food shipped from Amazon to save money. Since, you are only allowed enough food and formula/breast milk for infants to last the flight you may want to have a few extra’s waiting. Luckily for us a lot of these items were borrowed from family in the area with kids, were used by my husband when he was a baby, or could be found at garage or consignment sales. Start by knowing your child and what they will need when deciding what to ship, rent, borrow, or have supplied by family. Next, figure out what you can make yourself to cut costs, eliminate items that can be used twice, and supply easy to travel (no big deal if it’s ruined) entertainment. One can buy everything, but be realistic since you’re on a plane in a tight space and the kids aren’t going to be pleased with having to sit for hours on hours. I did purchase a few luxury items finding some to be practical necessities in my mind and others to be just nice to have. One item that I can’t help but rave over is the GOGOBABY! It attaches to the toddler car seat giving you wheels on the seat itself. This allows you to wheel behind you the car seat instead of juggle it while trying to maneuver an airport. Added bonus, your child can be strapped into the seat while you wheel it around keeping the kid contained, arms free for other bags, and a stroller like effect. I don’t recommend using it for a full time stroller once at your destination due to potential damage to the car seat and it, but for parking lots, airports, and short distances it’s awesome. Note: DO NOT ATTACH THE CARSEAT TO A CAR OR AIRPLANE SEAT WITH GOGOBABY ATTACHED!!!!! Common sense people obviously the seat won’t be properly secured and now you’ve added wheels to it making it more likely to move if in an accident or turbulence. It comes off and is fairly flat fitting in the overhead bin without counting to your carry-on allowance. The flight attendant told me some idiot did this(sorry if your that idiot) and it put the seat at an angle so the kid looked like they were holding on out of fear of falling forward not to mention it wasn’t secure in any way. This is my practical necessity purchase as it frees hands, secures the kid, and helps avoid damage to an expensive car seat, and smoothes the flow of travel greatly. The downside is that since airplanes aren’t made with wide isles you still have to pick up the car seat to take it down the aisle to your seat as there just isn’t room to wheel car seats down without majorly angering a ton of people and damaging your car seat in the process. Not the GOGOBABY’s fault, but wouldn’t it be nice to just wheel the whole way? My next cool purchase item is not practically necessary but very awesome to have and can double as other items thus eliminating some things from your supply list. The BYEBYE BABY is a baby hammock which is awesome for children under 9 months or under about 20 lbs. My son is a big baby at 20lbs and during the time of our travel not yet 6 months old. Even so it was nice to have this and I was able to use it elsewhere even though he was unable to completely stretch out (he didn’t seem to care). It attaches to the closed tray table on the seat in front of you, the baby belts in facing you and the other end belts behind you so the baby is facing you in a hammock and your hands are free. It’s nice to protect against wiggles during the flight for lap babies. It makes feeding the baby food easier and playing nicer as well. Added bonus to this item was that you can also use it as a pseudo booster seat or high chair when you’re out. We went to a restaurant and I used it to create a hammock on a regular chair making for a little seat for my son to sit. While it won’t boost older kids up it will work to attach them to chairs as well in lew of a booster or high chair. This eliminates your supply list by taking the highchair/booster seat off. It’s not too large either making it nice for travel purposes. If you already have a Moby while I’m not sure it can be used as the hammock in the airport I am pretty sure you can Moby wrap the baby to the chair to eliminate the high chair instead of getting this item. Just make sure to double knot the last knot and have the wrap tight against the chair never leaving the baby alone with either product because you never know what can happen and it only takes one minute. The last item I bought isn’t necessary at all and more of luxuries buy than anything. 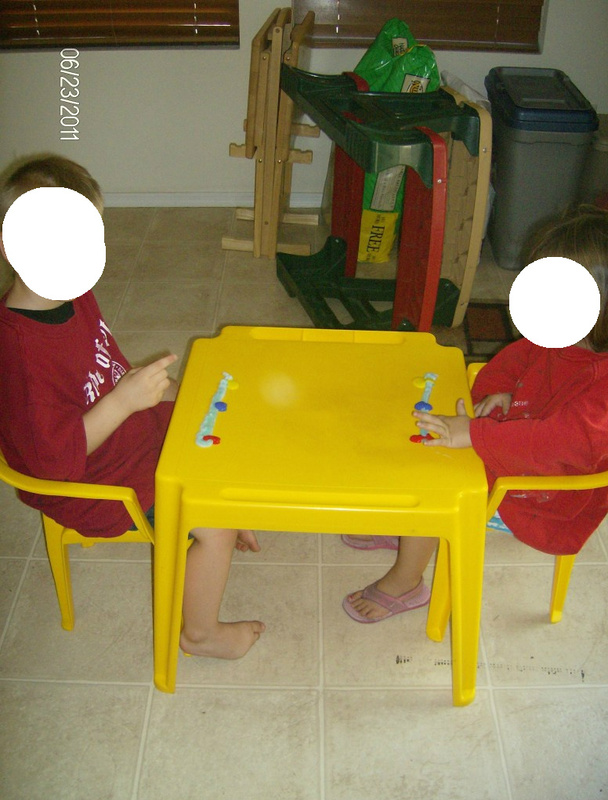 It was the foldable, play and stay tray. I attached it to my daughter’s car seat after she was loaded up so it stayed with her the entire trip. She seemed to be more into using it for hide and seek than to set anything on, but it did help keep things from falling on the ground during the flight which was nice. If you want to splurge this is a good item to splurge on as it keeps you from having to finagle yourself in a tight space to get a toy or fishy or something, but defiantly not necessary. An item that was a lifesaver that I already had was the portable DVD player and baby headphones. The headphones keep you from annoying your neighbor with the millionth showing of Baby Einstein, but the DVD player gives you at least 2 hours of kid focus. I brought a few learning DVD’s that I knew my daughter would enjoy and while I’m not a huge TV fan, it was great to have something for her to relax with giving her the distraction she needed from all the other new things on a plane to explore. You can also use a laptop, but please get headphones and keep the DVD player or laptop in front of you so little hands/fingers can’t explore and ruin your little distraction lifeline. That is it on the purchased items for this trip. I will continue to post the tips and homemade items as the week continues. In closing; Good Luck in your travels, wherever they be, and remember to always be prepared, safe, and alert! Let the kids be relaxed and have no fears to enjoy where they are, because they will know that with you everything and everywhere is safe! Life has been a little busy over the past two weeks and I have been unable to post as I do normally. First, I was busy getting the family ready for a trip back East to meet my husband’s side of the family, get to see where he grew up on a tour of Eric, visit DC for the first time, see my first Civil War reenactment, and expose the kids to a different environment than they have been. I will say while the trip was great leaving more to do and see (a sign of a good trip), taking two children under the age of 2 on a plane is not something I recommend if you have other options. The packing alone kept me up at night with worries of exceeding the 50lb limit on the suitcase I was packing for 4 (thank you southwest for at least allowing the bag to fly free if under 50lbs). Taking two babies on a trip where the time zone is different, they are surrounded with new things, places, and people which keep them on constant stimulation, and being on the plane itself with all its germs is very intense and leaves a need for recovery. The kids were exhausted from the travel and all the fun. Naps and sleep patterns were off. To add to the crazy, I live in the Phoenix area and the day we arrived back there was a monster dust storm right out of one of the Mummy movies. This naturally stirred up many ancient and not so ancient spores and bacteria making for outside play a no-go without risk to Valley Fever, Croup, or many other nasty bugs. Long story short, it’s been a busy past few weeks. We did a ton on our trip and I got plenty of new ideas and travel suggestions to share as I get back on the blog horse. So, thank you for continuing to follow the blog loyal readers. And let me close with my first travelling tid-bit: If you must travel with a child or two under the age of 2, make sure you have the support on the other side of the flight, the sanity to remain calm during, and an extra seat to strap in the car seat because it is defiantly worth the added fair!